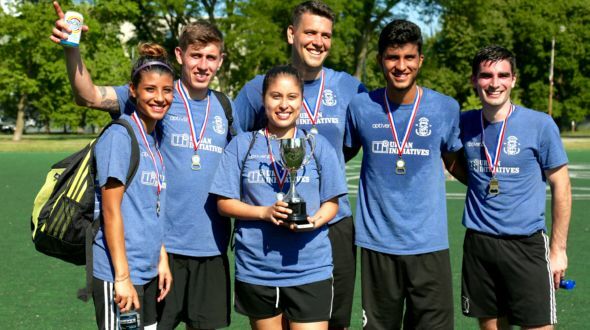 A year ago, CBRE claimed the throne at the first ever Corporate Challenge Cup at Humboldt Park in Chicago. As the months went by, buzz began to build among Chicago’s corporate community. Employees wanted to know what it was like to reach the mountain top and have bragging rights over every company in Chicago. As teams pledged their support for Urban Initiatives, the Corporate Challenge Cup began to take shape. Optiver, a global electronic trading firm, stepped up and signed on as the Presenting Sponsor for the 2nd annual Corporate Challenge Cup on Saturday, July 16. The countdown to recruit the best team was on at offices across Chicagoland. As the day arrived, 28 teams showed up ready to take the Cup. Once teams checked in and warmed up, UI’s own Jim Dower kicked the day off with a welcome address and reminded everyone of the true reason they came out to play some soccer: for the kids! As the balls began rolling across six soccer fields, teams already had their eye on the championship match. Group stage matches gave everyone a good opportunity to scout the talent out on the fields and there were some ballers out there. Once midday arrived, it was time for teams resting in between games to enjoy their lunch catered by Limelight and some ice-cold Coronas and Tocayos generously donated by Constellation Brands. Before the knockout stage could begin, Kirkland & Ellis and Storck USA went to a shootout to determine their match-ups. Teams began to fall one by one and before long, it was time for the championship game. Kraft Heinz and Northwestern Mutual outlasted all of the other teams and left it all out on the field. As the final whistle blew, the team from Northwestern Mutual prevailed and hoisted the Corporate Challenge Cup. This one of a kind event could not have been made possible without support from Optiver and all of our participating teams, volunteers, the Chicago Park District, Powerade, Limelight Catering, and Constellation Brands. Additionally, a special thank you goes out to our team captains for coordinating teams for their companies. We are so grateful for your support!